The coming global food crisis really hit home for me last year. I saw droughts destroying crops across California and food inflation worsening almost everywhere. Collapsing water supplies and radical weather patterns have only accelerated the crisis, and while food may appear to be abundant on grocery store shelves, the retail presentation of abundant food is a thin veneer, under which lies a fragile food supply wholly dependent on just-in-time deliveries, stable weather patterns, cheap water and cheap fossil fuels. The federal government's official inflation statistics are lies, of course, and government statisticians intentionally downplay the rising cost of food that's now putting quality, organic produce out of reach for even well-to-do Americans. In reality, food inflation is already in the double digits in America, with some experts predicting food prices may now begin to double every 3 - 4 years. The situation is far worse in Venezuela, where even CNN's news video features an expert predicting "1000% inflation" there. Food is in such short supply across Venezuela that even the wealthy can barely afford to eat. Grocery stores have been stripped bare, and the public panic is so severe that the government has now instituted biometric security scans to limit public purchases of price-controlled grocery items. Venezuela, it can now be confidently stated, is headed for outright economic collapse. Political chaos, starvation and war may not be far behind. 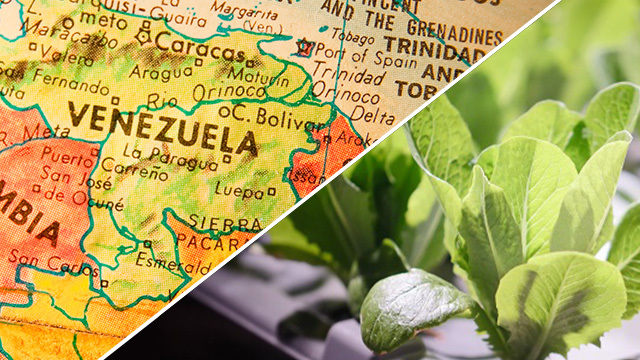 Sadly, Venezuelans could be easily and affordably feeding themselves if only they had their own home-based food production systems such as the Food Rising Mini-Farm Grow Boxes. Non-circulating hydroponics makes self-reliant food production easy, affordable and reliable. Pay attention: This information can help keep you alive and nourished in any food crisis. It can also save you a small fortune even in normal times, allowing you to easily grow food instead of purchasing it at unaffordable prices at retail. If Venezuelans had Mini-Farm Grow Boxes, they could be growing their own better-than-organic bunches of Romaine lettuce for less than 10 cents worth of plant nutrients. Even people who live in cities could be growing strawberries, tomatoes and herbs using grow boxes on their rooftops, patios, balconies and porches. The Mini-Farm Grow Box is a system that leverages the miracles of Mother Nature to convert low-cost plant nutrients (rocks) into high-value food. Think about it: Plant nutrients are just ground-up rocks containing nitrogen, calcium, magnesium, trace minerals, potassium, phosphorous and other essential elements for plant production. These rocks have an unlimited shelf life and can be stored forever, in almost any climate or temperature. By combining these powdered rocks (plant food) with water and feeding it into a Mini-Farm Grow Box, you can convert those rocks into nutrient-rich fruits, vegetables and herbs. All sorts of foods can be produced out of these systems: beans, lettuce, tomatoes, strawberries, oregano, basil and much more. Using modifications I'll be releasing soon on FoodRising.org, you can also use these systems to grow root vegetables like carrots, potatoes and beets. What's the value of being able to produce your own food during a hyperinflation food shortage in a country on the verge of chaos and collapse? Priceless, of course. When you're starving, food is even more valuable than gold. #1) Buy the system already made. It's available at www.SupplySource.com and comes with everything you need to start growing (other than sunlight, water and seeds). #2) Make your own system using common tools such as a hole saw and a cordless drill. I've posted free DIY videos here. #3) Print your own float valve parts using any 3D printer. I've posted the 3D object files for free at this link, and you can use T-glase 3D printing filament to print these objects on almost any 3D printer. Once you have a grow box system in place, you now need to start stockpiling plant food nutrients. I developed Ultra Clean Super Plant Food to be extremely low in toxic heavy metals and high in nutritive minerals like zinc. It's available in both small and large quantities. These plant nutrients are like food batteries because they contain "stored food potential." By combining them with water and the Mini-Farm Grow Box technology, you can transform these plant nutrients into strawberries. Or tomatoes. Or lettuce, beans, basil, oregano, cucumbers, melons and so on. Storing plant nutrients is like storing "future food." It's also a very high-density way to accomplish that goal when you consider that every 1 lb. of plant food nutrients can produce from 50 - 100 heads of lettuce. Yep, 1 lb. of plant food can produce 100 times its own weight in high-value food! So storing 100 lbs. of plant nutrients is the equivalent of storing 10,000 pounds of food. Obviously, it takes time, sunlight and water to grow these foods, but sunlight is free, water is remarkably conserved by this system, and time is something we all have in identical quantities. Some non-GMO heirloom baby greens can be grown to edible status in as little as 15 days. Lettuce plants are edible in under a month, and many strawberry species produce berries almost year-round. Once you get these grow systems going, they can produce a steady stream of food on a daily basis, provided you have the proper grow environment with moderate temperatures (which can also be accomplished with a greenhouse). In Venezuela right now, do you realize what a fresh head of Romaine lettuce can get you in barter? How about a pound of organic strawberries? Or a bucket full of fresh red tomatoes? Right now in Venezuela, at this very moment, these food items can be traded for insulin, antibiotics, gasoline or silver coins. Food is an extraordinary barter item because everybody needs it. Perhaps only silver and gold have more universal value, with the added advantage of high portability (value density). But food is universal. And because everybody needs it, when it's scarce, it becomes immensely valuable and can be traded for many high-value items. There may come a day in Venezuela when a bushel of vegetables is worth the value of an automobile. Would a starving person trade their car for a bushel of fresh food? You bet they would. You would too, if you're hungry enough. In fact, you'd trade your house, your 401K accounts, your corporate stocks and even your own family heirlooms for a few meals. The Mini-Farm Grow Box delivers food security. With these systems producing food at home, you are far less dependent on the centralized food factories and retail distribution centers (grocery stores). In Venezuela right now, there are strict limits on how much food you can buy each day at the store, but there's NO LIMIT on how much food you can grow using Mini-Farm Grow Boxes. Even when governments introduce biometric controls over food purchases by the public, they cannot limit your own desire to grow additional food on your own. Check out these photos of a Natural News reader who built her own non-circulating hydroponic system, all based on the same principles we teach at FoodRising.org.